Now, what I like least about teaching is grading. It is time consuming, boring, and never ending. I pass things back to students each day and wonder if they ever look at my feedback or grow from the comments I make. So this past year, my third, as the 9th-grade English teacher at my school, I stopped leaving comments on students’ writing. Before this experiment in grading, my students were all over the place as writers. One student, The Hurrier, never read over his work but thought that a turned in paper equaled a passing paper. Another student, The Procrastinator, rushed at the end of her paper, missing evidence or key components. A third student, The Overconfident, felt their work deserved an A and was angry at me for “giving” a grade that was unsatisfactory. And a fourth, The Perfectionist, never felt her paper was ready to turn in and obsessively read her paper over and over again. Each handled essays a different way and each were not using their rubric correctly to improve, revise, and empower themselves in their writing. What would happen, I wondered, if I stopped giving comments or grades to students’ writing and had them evaluate and articulate the value of their work to me? As a Mills Teacher Scholar, I had an opportunity to mull this idea over with my colleagues. If it worked, I would free myself of over 50 hours of grading time over the course of the year. More importantly, my students would become more empowered, capable writers. I held my first round of writing conferences in September and a second in October and recorded them to listen closely to what my students had to say. Students were proud, disappointed, quiet, and talkative. Some laughed, a few shed tears, and all had different points to make about their writing. My understanding of my seventy, 9th graders’ needs was becoming more individualized and also more interesting. What I did not expect to discover was my own bias in these writing conferences. As I listened to the recordings, I became aware that depending on who my students were – The Procrastinator, The Perfectionist, The Overconfident, The Hurrier – I would step up or step back more in the conference. Often, my assumptions prevented them from showing me their ability to use the language on the rubric or point to evidence in their writing. What struck me the hardest was listening to the recording of my student with special needs who has an Individualized Education Plan (IEP). In comparison to conversations with other students, I used much more teacher talk in the conversation with him. Because I doubted his abilities, I didn’t let him show me his skills. I sat at my desk and listened to the recording again, distraught and disappointed in myself. 1) How did this piece of writing go for you? 2) Can you walk me through each strand on the rubric and your annotations on your essay to explain to me the grade you earned? 3) If a student needed prompting I would say: Let’s look at the __ strand now, what do you think? Now, aware of my bias, I could listen, observe, and see patterns more clearly. Not only were my students having more fun and gaining confidence in this process, but they were starting to meet my goals. They were leaving 9th grade with a more important tool than an “A” on an essay: they could use the language of a rubric to assess their own work accurately and point to evidence in their writing to support that assessment. And for me, I was gaining 50 hours back of my out of school life from grading, becoming more of a coach than an assessor in my students’ eyes, and reading higher quality work. I am going to continue this writing conference routine next year and I hope my students can show off their new self-assessment skills to their 10th- and eventually 11th- and 12th-grade teachers as they become more confident. I hope too that as a staff, we can shift our culture to one of commenting less and listening more, so we can build our students’ confidence and capabilities as we all spend a little less time grading. 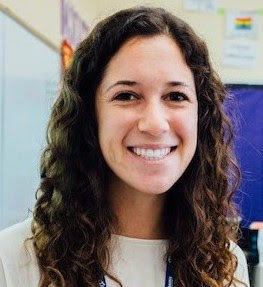 Nina Portugal is in her fourth year at Life Academy of Health and Bioscience and 6th year with Oakland Unified School District. Prior to Oakland, Nina taught English at a bilingual high school in the South of Spain and at a Charter School in South Chicago. Nina spent her first two years in Oakland focusing specifically on Long Term English Learners and English Language Development and currently teachers 9th grade Humanities. When she is not teaching her high school students, Nina is teaching her yoga students at Left Coast Power Yoga in Oakland. What would happen, I wondered if I stopped giving comments or grades to students’ writing and had them evaluate and articulate the value of their work to me?